Charles Moore never expected to be a hero to the medically underserved. His specialty is complex head and neck surgery for meningiomas, neuroblastomas, and other brain tumors at the front of the skull and reconstructive surgery to repair trauma to facial bones and tissue. 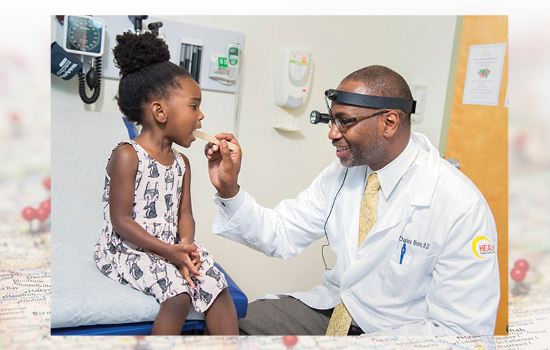 But as a young Emory medical professor and surgeon, he met patients at Grady Memorial Hospital unlike any he saw while training at Harvard and the University of Michigan. Patients with enormous, bulbous tumors on their tongues and necks. Why hadn't they come earlier, when he could have saved them? He looked at their zip codes and found neighborhoods plagued by poverty, unemployment, lack of healthy food, and transportation. Somebody has to do something, he said. So, after long clinical days at Grady and Emory, he packed tongue depressors, gloves, and disposable dental mirrors in the back of his car and began offering free head and neck screenings. For many who lined up, he was their only source of medical attention. education, and a wide range of medical, dental, and mental health services to more than 6,000 Atlantans annually. Fees slide between no cost to $20. A partnership with Emory's Urban Health Initiative (of which Moore is co-director) provides transportation, community gardens, and other needed programs. Without the center, many patients would have ended up in emergency rooms. Others don't know where they would have gone. Moore teaches his own students what he didn't learn in medical school: sickness and health take place in patients' environments. With little money and no insurance, people choose food over medicine. Without transportation, they call an ambulance, or they just don't go. But, Moore says, if you help people surmount those barriers, they will come.